Both red and white Knog Frog lights have hopped into the Persons-Majestic warehouse and are available for immediate shipment. The lights will last for up to 360 continuous hours on one set of coin cell batteries and feature both a steady and flashing mode. Plus, they can be clipped to practically any part of a bicycle, and they weigh a miniscule 12 grams. 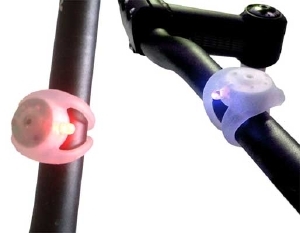 In addition, the popular red and white Knog Frog twin packs are available, as well as blue and green Knog Frog lights. "IBDs are finding that Knog Frog lights have a great sell-through," says Charlie Persons, President of Persons-Majestic. "The lights are bright, attractive and last a long time. Plus the price point is excellent." For a catalog showing the complete line of Knog products and new price list, dealers should contact Persons-Majestic at 1-800-772-2453 or e-mail permaco@aol.com.